This thread over on Beeradvocate.com got me thinking about all of the fresh hop beers I’ve had out in the NW, and which ones stick out. 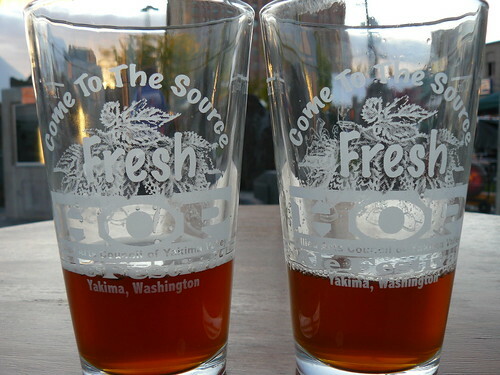 It also got me thinking about what actually qualifies as a “fresh hop” beer. This is the time of year that you should start looking forward to some fresh hop/wet hop beers. They are literally just around the corner…and in some cases they might already be available. What have been some of your favorite Fresh Hop beers in the past, and what breweries have you heard are doing a fresh hop beer this year? – The Laughing Dog Hop Dog Harvest Ale (winner of last year’s Yakima Fresh Hop Ale Fest for the past two years) has to be my favorite…that I remember at least. Fresh hops are the first recently dried hops… AKA Southern Hemisphere and Celebration. Dried hops, only, very recently dried. Wet hops are green, un-dried hops…from the fields into the glass. For us, Estate Ale and Harvest Ale are wet hop beers. As for Harvest Ales, it seems that just because a beer calls itself a Harvest Ale doesn’t mean it has fresh hops (As I used to think). It could mean that the beer is brewed as a celebration of the harvest. But, many Harvest Ales do indeed use fresh hops. There is no easy way to pull all your “fresh hop” ratings on Ratebeer, so I very likely missed a few. I’ll be in Hood River, OR. the weekend of Oct. 3rd to do the Fruit Loop (apples, pears, etc.) and for the 6rh Annual Hood River Hop Fest (my third in a row). I’ll try to take some pictures and give a report. We stay in a B&B using the Stash Tea pay for one night, get the second night free program (stashtea.com).